Attending high school class reunions can be strange. Good strange and bad strange. Sort of all mixed together. 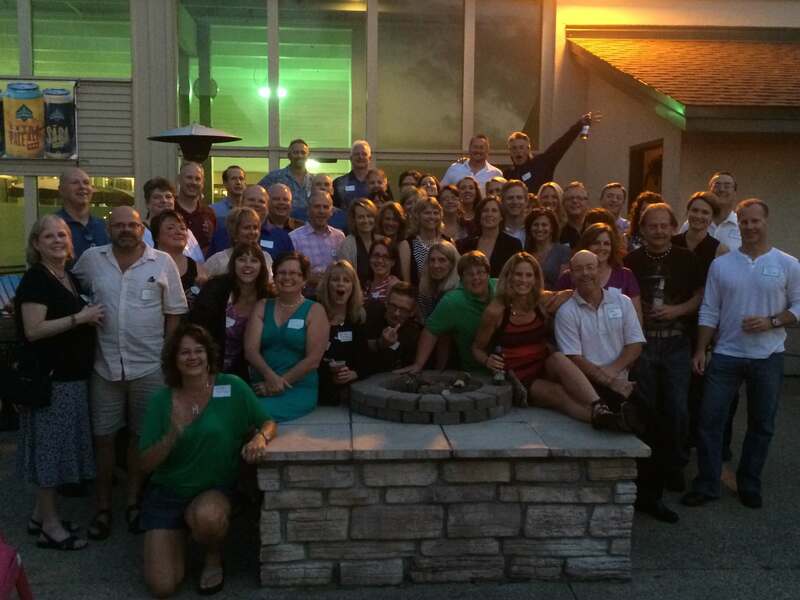 Last weekend I attended my 30th class reunion of Mayo High School in Rochester, Minnesota. It was great to see people and I appreciate the work done by those who set it up. Interestingly, the group of guys that I was most close to in high school, and still stay in contact with, only one of them came to the reunion. The others had things going on or simply chose not to attend. What was fun, is that I got to spend some time with people that I knew when we were in high school but didn’t know other than by association. Out of a class of 440 kids, we had about a 10% attendance rate so it wasn’t a raucous affair by any means. I didn’t make it to our ten year reunion because my family and I lived in St. Louis, Missouri at that time and I didn’t know that it was going on. Heck, Jean and I had four kids under five years old at that time and we hardly had time to do anything, let alone go back to Minnesota for a class reunion. I heard that it was fun. I did attend the twenty year as we had moved back to Minnesota and was more in tune with what was happening with my old cronies. I enjoyed this reunion as there were many people that I saw whom I had not seen in twenty years. That reunion was pretty well attended and I was surprised that the thirty year reunion had gotten smaller because I thought that Facebook would make things so much easier to build awareness and excitement for the event. 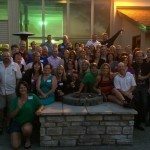 For the twenty year, classmates.com was the go-to source for reunions and that was a bit clunky. It’s amazing how things change! 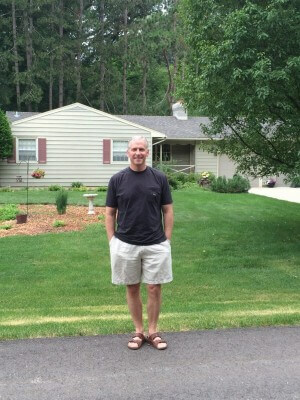 While we were down in Rochester, Jean and I walked around Silver Lake, ate at John Hardy’s BBQ and went out to my old neighborhood and took a picture of me in front of the house. If there was anyone home, they may have been a little creeped out! It was weird being back in my old neighborhood. We used to have a Lilac hedge that shielded the house from the street and we played street hockey out in front. Now they’ve cut-out the hedges and the house looks very nice. 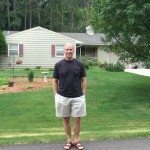 It looked nice then, too, just different (My mom and dad may be one of the only readers of this blog so I have to be a little careful about what I write). When I was growing up I remember my dad putting cedar shakes on the house one summer and now they’re gone. Things change and that was about 35 years ago so they must have held-up pretty well. Other than couple of cosmetic changes, things look pretty much the same in the old ‘hood. Back to the reunion. It was really fun to be back around the people that were part of my life so many years ago. It’s hard to imagine all of the different paths that people have taken and I wish that there had been more time to visit with those whom I didn’t have a chance to catch-up with. Aging is a funny thing. Not like funny, ha-ha. Just, you know, funny. I looked around that room and saw a bunch of people that I knew a long time ago and we share a common bond of a three year period of our lives in what we all call our hometown where the world was full of possibilities and the future seemed so far away. I was struck by the notion that what’s great is that the world is still full of so much opportunity, the future is today and I am grateful. Grateful for the path that I’ve walked, the choices that I’ve made to chart my course and for those with whom I’ve walked. As Mark Twain said, “Age is an issue of mind over matter. If you don’t mind, it doesn’t matter.” Me, I kind of enjoy getting older…. Nice piece Joel, well put. I enjoyed our chance to chat. I was talking to a friend of mine here in AZ and mentioned that I think you and I talked more last weekend then the entire 3 years we roamed the halls together. I, for one, rather enjoyed it, and hope you did as well. Take care of yourself and your family. See you in 5 years! You’re right about that, Eric! I made a similar comment to a friend of mine here in the Twin Cities. Also, in case you’re wondering, Greg Avant is, in fact, working at Lone Tree today so you should go an catch him on a day that he is there! I look forward to seeing you again in five years, too. Who knows, maybe our paths will cross sooner…..be well and I wish you continued success.